“Education is in my bloodstream. I made a commitment to a life in education because of a desire to make a difference in people’s lives. Education is power—no one can take it away from you. With an education, you can improve your circumstances, contribute to your family, give back to the community, and serve as a role model and leader. I started my career as an elementary school special education teacher. Over the course of my nearly four-decade career, I have been a teacher, a college professor, a college administrator, and an executive. I know that in the next five years, 60 percent of jobs will require education beyond high school. There is a demand for an educated workforce, and Phoenix College is responding. Forty percent of our student body is Hispanic. As a community, Hispanics face some major obstacles to higher education. Family commitments often interfere, and finding the time or funding for education goes by the wayside. We offer a number of support services for students. Families may not have a “college-bound” philosophy, and in some cases limited English skills hinder them; we can help with course selection, career planning, and financial aid and provide mentoring and tutoring. Many of our students are first-generation college students like I was. My mother graduated from high school, but my dad dropped out in ninth grade to work. Both of my parents stressed upon me the importance of obtaining an education. I earned three degrees from Arizona State University (a bachelor’s, master’s, and doctorate). A significant number of our faculty are Hispanic, many of whom are first-generation graduates who can relate to the students. When hiring, we try to mirror the demographics of the community. It’s important to have Latinos working with Latino students to serve as role models and relatable advisors who share their culture and values. My top piece of advice for students at all levels is stay in school. Take advantage of the valuable opportunities available to you. Ask questions so you can make better decisions. Find a mentor in someone you respect. Apply for financial aid and scholarships to further your education. Take advantage of the support systems available to you. Meet with faculty and ask questions. And be technologically savvy. 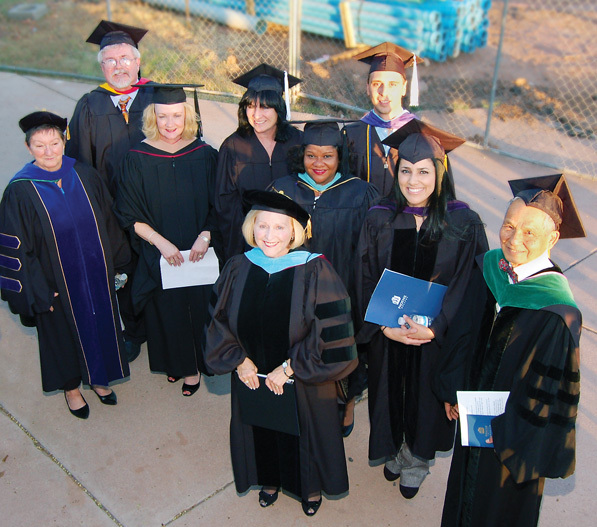 Dr. Anna Solley (front, center), Phoenix College president, with other Phoenix College administrators, faculty, staff, and keynote speaker Dr. Simon Myint (far right), prepare to celebrate the annual commencement ceremony. We’re in partnership with the Lumina Foundation on Degree Phoenix. Our goal is to increase the access to education and the success of young Latinos. Another program held on our campus for Hispanic students is the annual Dare 2 Dream Conference sponsored by the Raul H. Castro Institute and local school districts. Hundreds of middle school students and their parents attend and participate in activities that encourage the pursuit of higher education.